All Brumhaus art prints and other merchandise can be purchased online. Items are despatched directly by Redbubble to your door. * Please note that signed prints are only available on Etsy and Art Markets. Framed prints can be purchased with a multitude of options on Redbubble, and can be shipped worldwide. You can buy Brumhaus prints at size A0 if landscape/portrait or 1m x 1m for square artworks. Art prints can be supplied framed and ready to hang on your wall. Canvas prints can be ordered for bigger sizes in most artworks. If you are interested in ordering a bigger size print, please email alex@brumhaus.uk with the requested size, your postcode and the name of the print you would like to order. A quote and handling time estimate will be emailed to you. Payment is required when the order is placed. BT Tower art print supplied at A0 size in a soft black aluminium 9mm frame. Brumhaus supplies signed, framed art prints directly via Etsy. These are typically comprised of a standard black aluminium frame with no mount, which compliments the contemporary style of artwork perfectly. Some large prints are available in timber frames with mounts (check Etsy for stock). For more information on framed prints please view the Etsy page or email alex@brumhaus.uk (Framed prints from Etsy are handled by the artist. Please note these are for local delivery or collection only). 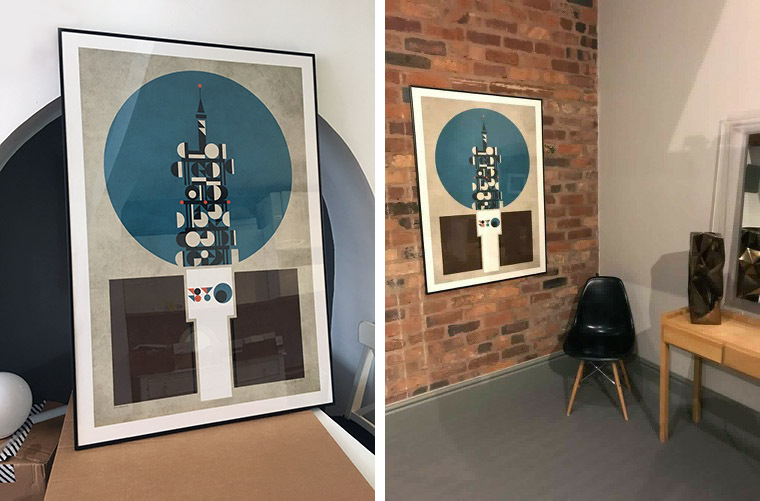 Brumhaus art prints are not limited editions.